In this form of optical microscopy, the focused beam of a laser is scanned over the sample and the reflected intensity is displayed as a function of position to create a digital reflected light image of the sample. Scanning a focused laser beam allows the acquisition of digital images with very high resolution since the resolution is determined by the position of the beam rather than the pixel size of the detector. Laser Scanning Microscopy (LSM) and Confocal LSM (CLSM) permit a wide range of qualitative and quantitative measurements on difficult samples. These measurements include topography mapping, extended depth of focus, and 3D visualization (red/blue). Because Si and GaAs are transparent in the near infra-red, imaging can be done through the wafer backside using an infra-red laser, often without thinning. Using the stepping motor of the stage, a high resolution composite image of a large planar surface can be easily obtained. Topographical map of a Canadian penny taken with 20 depth slices at intervals of 1.5um. 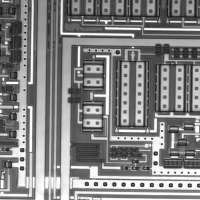 Chip circuitry viewed through the back side of the Si chip with infra-red LSM. 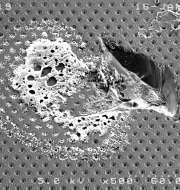 Electron microscope image of defect in power device bond pad and associated CLSM image with depth profile.